When I write it’s in the moment and a culmination of the past month or years. I have so much to say, yell about, and communicate. It’s very difficult to put all that into 800 words. That’s all, you say? Yes, that’s all. But I take it very seriously when need be, and because I like to laugh that content belongs in this space, too. But I’m running out of things to laugh about. It has to do with the hate and fear-mongering the Republicans are spewing and the Democrat’s kicked-dog syndrome in response to it. Really though, what is happening to our country? Turtle Island was ours first and then the immigrants showed up and literally destroyed and poisoned it. If there was a Garden of Eden, we Indigenous People lived in it. We prayed and were appreciative of the bountiful gifts the Creator provided us with. The reckless haste and waste that the 1% are acquiring $$$$$$$$$$$ is sickening and short sighted. They don’t get that money in and of itself is worthless except as toilet paper or lighting a fire with. I say let them go into their bunkers and leave the rest of us alone to deal with the aftermath of their destruction. Yes, I’m very sad but mostly angry at the current state of our Earth. No animal, except humans, could or would have laid waste to our Mother such as is happening now. So here in Rezberry there is an annual celebration for enrollees and their family. There are festivities for the kids, a feast and cash drawings for the adults. There are always cultural activities too, like at the museum I used to work for. Boozhoo Jeff! I got to make some jingle earrings with his daughter Leah and they are soooo pretty! I love that we get to celebrate us especially since we weren’t supposed to be here anymore. All thanks to our ancestors who refused to be beaten even in the face of true evil. Yanno what? I feel in my bones and blood their love and strength to carry on yet another day and then some. We –you and I – have to honor that sacrifice. We wouldn’t be here without them. For the record I didn’t win any cash but I got a free pizza cutter when I signed up. Im’a use it next per-cap day when I can afford frozen pizza. Shhhhh!!! I also saw a bunch of people who I love and hugged, and more that I absolutely abhor. <shivering> Those creatures are horrible any time but having to see them in a concentrated venue is torture. Ick. Talk about a microcosm of insanity. It only happens once a year so that’s good. I just wanna know who’s throwing my ticket out of the barrel. Next up is the Fond du Lac Veterans Powwow the first weekend in July. I know a lot of the Veterans Committee and they are such good people who want their kindred to be recognized. If you are a Vet, near or far, come check out our hospitality. And thanks for your service. My father Jerome Charette was Air Force. I’m sure every Indian family has someone who served voluntarily in the military. This was our land first. Sooo…. My social calendar is filled up for the foreseeable future but I still need to make it to Minneapolis, my old stomping grounds, to visit with Daniel, Rachel and kids. It’s so comforting for me when I stay with them, it’s like I never left! 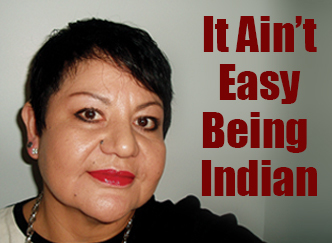 I become the City Indian I grew up as and I love it! I think it’s strange though how even if we live in the Big City we still consider our rezzes as ‘home’. Come to think about it, wherever we step is ‘home’ for us!!! I know quite a few former City Indians who moved back to their rezzes and I really wonder why? My own motive was my Gramma Rose, so I can be near her. But what of others? Write me and let me know. My email is at the end of this column.